Built on latest Gabfire framework, with LinePress, we wanted to harness the look and feel of an online newspaper, but maintain the ease of a standard blog. 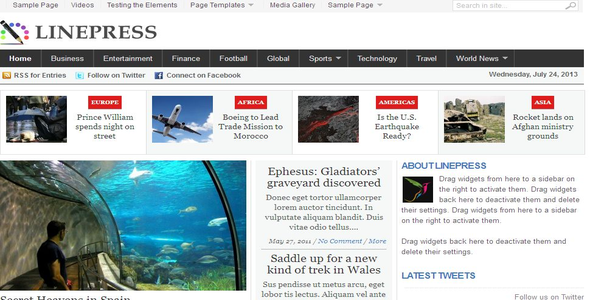 There are dozens of theme options to modify the site to your liking. Most importantly, you can expect the same level of thought-work put into the LinePress back-end as any of our other newspaper themes. With the various options in the theme control panel, you can disable sliders, enable/disable auto rotation, set number of posts and many other options. On the theme control panel, define which category or categories to be displayed in the media gallery mode using our nicely designed media gallery template. Share the post "Linepress themes"